It’s gonna be a blast! It’s for kids pre-Kindergarten to grade 4. It’s LEGO themed. And It’s FREE! Join us each evening during the week of July 25 through 29th. Each night from 6:00pm-7:30pm is going to be packed with games, crafts, songs, skits, Bible stories, and more! Kids are welcome to drop-in any or every evening. There’s something new each day! But don’t miss the Friday’s family BBQ! 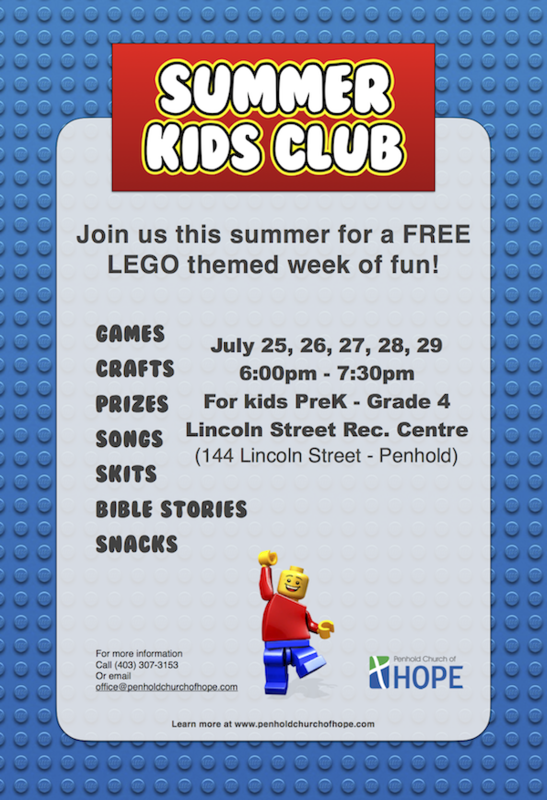 The whole family is invited that night for supper, games, a short closing program, and information about our weekly kids club and youth group starting up this fall! It’s all happening at the Lincoln Street Rec. Centre (by the Splash Park/Outdoor Skate Rink). We’ll see you there!